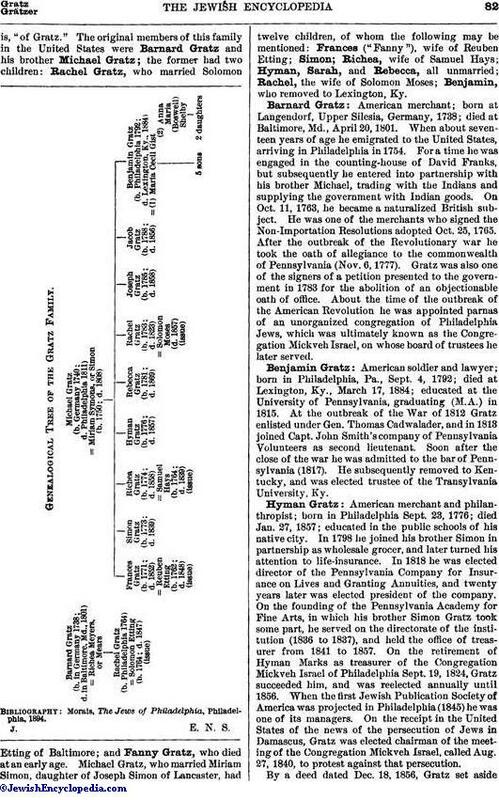 American family prominent in the affairs of the city of Philadelphia and of the state of Pennsylvania. According to some authorities, the name "Gratz" is derived from a town in Styria, Austria; according to others, from a city in Posen, Prussian Poland. Both suppositions, however, are probably wrong. The true place of origin is most likely the town of Gratz in Austrian Silesia, whence the family or some of its members removed to Langendorf (since 1745 in Prussian Silesia), which town was known then and later by its old Slavonic name. The name of the family was then "Grätza," thatis, "of Gratz." The original members of this family in the United States were Barnard Gratz and his brother Michael Gratz; the former had two children: Rachel Gratz, who married Solomon Etting of Baltimore; and Fanny Gratz, who died at an early age. Michael Gratz, who married Miriam Simon, daughter of Joseph Simon of Lancaster, had twelve children, of whom the following may be mentioned: Frances ("Fanny"), wife of Reuben Etting; Simon; Richea, wife of Samuel Hays; Hyman, Sarah, and Rebecca, all unmarried; Rachel, the wife of Solomon Moses; Benjamin, who removed to Lexington, Ky.
Genealogical Tree of the Gratz Family. Morais, The Jews of Philadelphia, Philadelphia, 1894. American merchant; born at Langendorf, Upper Silesia, Germany, 1738; died at Baltimore, Md., April 20, 1801. When about seventeen years of age he emigrated to the United States, arriving in Philadelphia in 1754. For a time he was engaged in the counting-house of David Franks, but subsequently he entered into partnership with his brother Michael, trading with the Indians and supplying the government with Indian goods. On Oct. 11, 1763, he became a naturalized British subject. He was one of the merchants who signed the Non-Importation Resolutions adopted Oct. 25, 1765. After the outbreak of the Revolutionary war he took the oath of allegiance to the commonwealth of Pennsylvania (Nov. 6, 1777). Gratz was also one of the signers of a petition presented to the government in 1783 for the abolition of an objectionable oath of office. About the time of the outbreak of the American Revolution he was appointed parnas of an unorganized congregation of Philadelphia Jews, which was ultimately known as the Congregation Mickveh Israel, on whose board of trustees he later served. American soldier and lawyer; born in Philadelphia, Pa., Sept. 4, 1792; died at Lexington, Ky., March 17, 1884; educated at the University of Pennsylvania, graduating (M.A.) in 1815. At the outbreak of the War of 1812 Gratz enlisted under Gen. Thomas Cadwalader, and in 1813 joined Capt. John Smith's company of Pennsylvania Volunteers as second lieutenant. Soon after the close of the war he was admitted to the bar of Pennsylvania (1817). He subsequently removed to Kentucky, and was elected trustee of the Transylvania University, Ky.
American merchant and philanthropist; born in Philadelphia Sept. 23, 1776; died Jan. 27, 1857; educated in the public schools of his native city. In 1798 he joined his brother Simon in partnership as wholesale grocer, and later turned his attention to life-insurance. In 1818 he was elected director of the Pennsylvania Company for Insurance on Lives and Granting Annuities, and twenty years later was elected president of the company. On the founding of the Pennsylvania Academy for Fine Arts, in which his brother Simon Gratz took some part, he served on the directorate of the institution (1836 to 1837), and held the office of treasurer from 1841 to 1857. On the retirement of Hyman Marks as treasurer of the Congregation Mickveh Israel of Philadelphia Sept. 19, 1824, Gratz succeeded him, and was reelected annually until 1856. 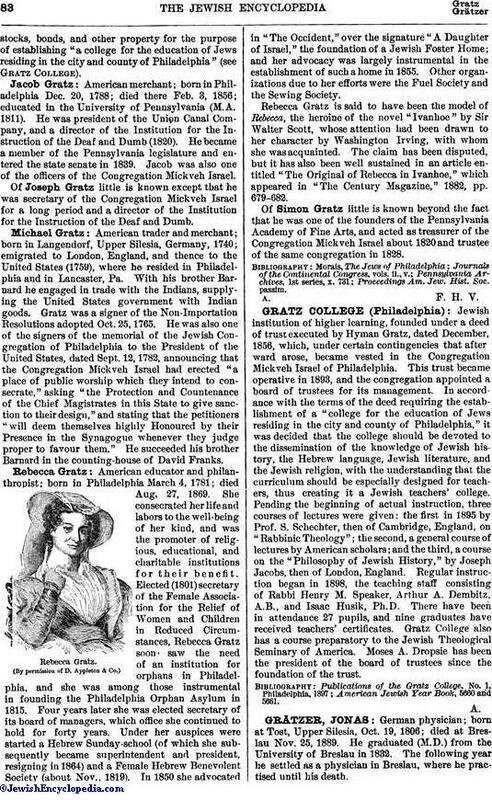 When the first Jewish Publication Society of America was projected in Philadelphia (1845) he was one of its managers. On the receipt in the United States of the news of the persecution of Jews in Damascus, Gratz was elected chairman of the meeting of the Congregation Mickveh Israel, called Aug. 27, 1840, to protest against that persecution. 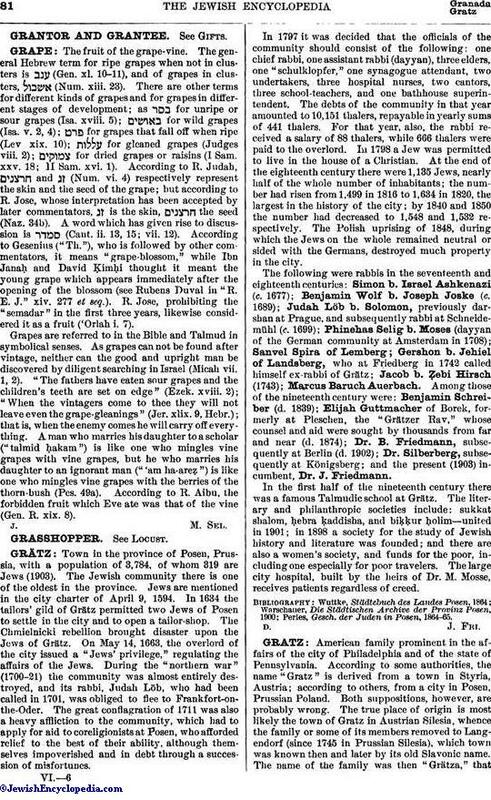 By a deed dated Dec. 18, 1856, Gratz set asidestocks, bonds, and other property for the purpose of establishing "a college for the education of Jews residing in the city and county of Philadelphia" (see Gratz College). American merchant; born in Philadelphia Dec. 20, 1788; died there Feb. 3, 1856; educated in the University of Pennsylvania (M.A. 1811). He was president of the Union Canal Company, and a director of the Institution for the Instruction of the Deaf and Dumb (1820). He became a member of the Pennsylvania legislature and entered the state senate in 1839. Jacob was also one of the officers of the Congregation Mickveh Israel. Of Joseph Gratz little is known except that he was secretary of the Congregation Mickveh Israel for a long period and a director of the Institution for the Instruction of the Deaf and Dumb. American trader and merchant; born in Langendorf, Upper Silesia, Germany, 1740; emigrated to London, England, and thence to the United States (1759), where he resided in Philadelphia and in Lancaster, Pa. With his brother Barnard he engaged in trade with the Indians, supplying the United States government with Indian goods. Gratz was a signer of the Non-Importation Resolutions adopted Oct. 25, 1765. He was also one of the signers of the memorial of the Jewish Congregation of Philadelphia to the President of the United States, dated Sept. 12, 1782, announcing that the Congregation Mickveh Israel had erected "a place of public worship which they intend to consecrate," asking "the Protection and Countenance of the Chief Magistrates in this State to give sanction to their design," and stating that the petitioners "will deem themselves highly Honoured by their Presence in the Synagogue whenever they judge proper to favour them." He succeeded his brother Barnard in the counting-house of David Franks. American educator and philanthropist; born in Philadelphia March 4, 1781; died Aug. 27, 1869. She consecrated her life and labors to the well-being of her kind, and was the promoter of religious, educational, and charitable institutions for their benefit. Elected (1801) secretary of the Female Association for the Relief of Women and Children in Reduced Circumstances, Rebecca Gratz soon saw the need of an institution for orphans in Philadelphia, and she was among those instrumental in founding the Philadelphia Orphan Asylum in 1815. Four years later she was elected secretary of its board of managers, which office she continued to hold for forty years. Under her auspices were started a Hebrew Sunday-school (of which she subsequently became superintendent and president, resigning in 1864) and a Female Hebrew Benevolent Society (about Nov., 1819). In 1850 she advocated in "The Occident," over the signature "A Daughter of Israel," the foundation of a Jewish Foster Home; and her advocacy was largely instrumental in the establishment of such a home in 1855. Other organizations due to her efforts were the Fuel Society and the Sewing Society. Rebecca Gratz is said to have been the model of Rebecca, the heroine of the novel "Ivanhoe" by Sir Walter Scott, whose attention had been drawn to her character by Washington Irving, with whom she was acquainted. The claim has been disputed, but it has also been well sustained in an article entitled "The Original of Rebecca in Ivanhoe," which appeared in "The Century Magazine," 1882, pp. 679-682. Of Simon Gratz little is known beyond the fact that he was one of the founders of the Pennsylvania Academy of Fine Arts, and acted as treasurer of the Congregation Mickveh Israel about 1820 and trustee of the same congregation in 1828. Proceedings Am. Jew. Hist. Soc. passim.